Stickley Furniture Reviews - Mission Oak and Cherry Collection Reviews! / Stickley Furniture Reviews – Mission Oak and Cherry Collection Reviews! Stickley Furniture Reviews – Mission Oak and Cherry Collection Reviews! Stickley have become one of the leading furniture makers in America with products in homes across the nation. One of the oldest furniture manufacturers their story dates back to the early 1900s where Flemish man Gustav Stickley set up his furniture business to create honest furniture. He was sick of fake joinery and shoddy workmanship and wanted to create a viable alternative. 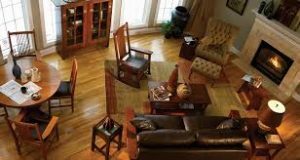 In this Stickley Furniture reviews page we will talk about Stickley Furniture's history, some of their values, we will review some of their most popular products, and we will go over their warranty policy. Fast forward 100 years and Gustav’s legacy continues. The Flemish high levels of construction quality have endured and the phrase Als Ik Kan- To the best of my ability still rings true with Stickley products. Committed to excellence in hand made furniture the Stickley company grew quickly until 1950, when the family passed away. For over a decade the business struggled to adapt to the changing time of mass production and it wasn’t until the 1970s ,when the Audi family took over, that Stickley’s began to flourish once more. Stickley Furniture is rooted in enduring tradition, superior craftsmanship and a philosophy of excellence. They specialise in custom made, solid construction and in crafting beautiful furniture. Stickley has become well known for their great quality, well sourced material and superior skill in furniture manufacture. In their long history Stickley have diversified their product range. Now they craft furniture for the whole home, including bedrooms, living rooms and dining rooms. They also have a collection of antiquities and rugs available. Stickley’s most popular and highest quality products are their Mission Oak and Cherry collection and their leather upholstery. If you are looking for other Cherry furniture, then check out Arhaus Cherry furniture. Both of these ranges of products really show the superior quality of Stickley’s furniture than alternative brands. Stickley have an unmatched knowledge of their trade and utilise the most advanced methods when creating their furniture. Pinned Mortise and Tenon joinery is used on all of their doors to give additional support and strength with splining used to provide the strongest possible corners. The construction quality of Stickley is extremely high, with all of their wooden units incorporating the best materials and best craftsmanship. 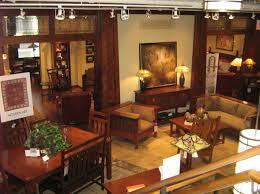 Stickley's Furniture is so high that it is commonly referred to as heirloom type furniture. That being said you get what you pay for, and in this case Stickley's price is quite high because each piece is meticulously crafted by hand. If you are looking for a mass produced furniture that shares similar quality but is a more reasonably priced high tier furniture then I would suggest you take a look at Flexsteel and Southern Motion. Stickley have a range of options for each piece to give the customer the most control over the design process. Let’s take a look at the main Stickley products. Mission is the more modern collection of furniture from Stickley. It incorporates traditional elements but in a unique way that appears fresh to the world. The mission collection makes the furniture the centrepiece of the room and provides timeless quality. Sophistication and class sum up this style. Inspired by asian designers and developed by artists the Pasadena Bungalow collection is a transitional style. It offers a unique taste to your home and a refined feeling to any room it’s housed in. The coronado collection features a mix of woods which complement each other. They give a uniquely rustic feel and provide the most traditional feel. After selecting your style you’ll be able to customise the colouring and finish of the wood. All of Stickley’s finishes are hand rubbed, sticking with the hand crafted feel of each of their products. If you are looking for other hand finished furniture, then Kincaid offers hand rubbed furniture! There are over 30 different finishes, with dark choices like Oxford and lighter Sand finishes. It’s always worth taking some time to evaluate which finish will complement your furniture and home most effectively, especially seeing as Stickley is built to last. Nothing shows more class and distinguished taste in a living room than a leather sofa or recliner. There are a number of different types of leather, these range from soft leather like their “Aniline” leather to the tough “everyday” leather. The tougher leather is better to protect your furniture from skills or wear and tear (perfect if you have children). There are a number of different types of leather furniture available. Sofas, recliners, ottomans and loveseats are all available in a range of leathers. There are also chair sets which consist of multiple units. 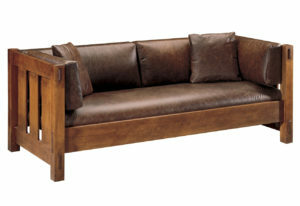 Stickley also feature the sectionals from the 100, 200, 300 and 400 range. Each of these are highly customisable with lots of different options so you can build your perfect sized sofa. ● 400 series: Seat height: 21 inches, Depth 40 inches, Cushions 6 inches. Motion options included. Zero clearance backs to fit tightly to walls. All of the sectionals are highly customisable for your needs and the space available. The leather used by Stickley is very high quality, the best thing to do is to go and experience it in your local dealership before deciding on which type. If you are looking for sectionals and recliners that are also made of high quality leather, then check out Barcalounger leather. Stickley show their skill and knowledge in each of their products. Hand made and expertly crafted you can put your faith in all of Stickley’s products. There is a varied choice of different products, colours and finishes. If your budget allows then the hardwood is a great choice providing the best quality and most value to your home. If you can, try to look for something from Stickley. I've got a bedroom set, a chair and a stereo cabinet from them, and barring a fire they'll be handed down to my children and probably grandchildren. I have a Stickley chair that I bought over twenty years ago, and I wanted to buy a matching stereo cabinet a couple months ago. I was able to get the finish code from the chair (it's burned into the underside) and get the exact same finish for the stereo cabinet. They match perfectly. 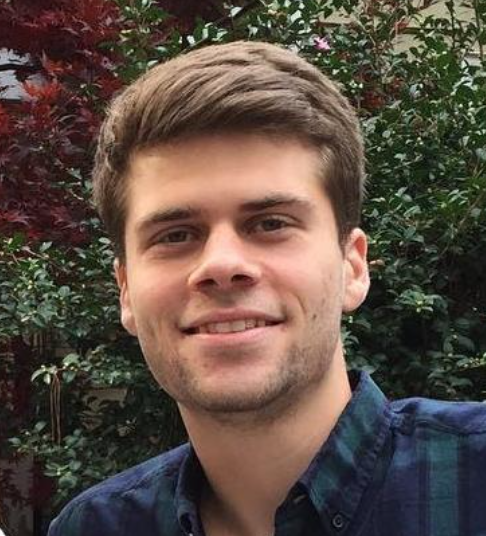 “I purchased a leather recliner and it arrived in January 2015. By May 2016 I noticed the leather on the corners of the recliner foot pad wearing out” - Sandra S.
Always be aware of which leather you’re buying and make sure it’s the most appropriate for your uses. Stickley offer detailed guides on maintaining your furniture and it’s always worth checking them out. Also be aware of what your warranty covers and for how long- this will make it easier if something does go wrong. Overall users are singing the praises of Stickley over their quality, design, style and materials. If you are looking for a sofa then consider Stickley, because of their extremely high quality and their stylish looks. Stickley sofa's are indeed quite pricey compared to more traditional and contemporary models. That being said, these sofas are made well, and their quality is worth the higher price tag. One of my favorite series of Stickley sofas is definitely the Mission series. 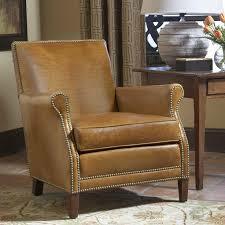 The Mission series of Stickley is very clean looking and prides itself over clean lines and functionality. A great thing about this series is that it really focuses on a look that not only is contemporary, but it will be appropriate for many years to come. This series is made fully out of Cherry and Oak hardwood which makes it extremely stylish and the durability of these hardwoods makes it a great choice. Similar to sofas, recliners are a great option for adding comfort and style to your living room. Stickley offers a few options for recliners, which are not only extremely comfort but also look great. 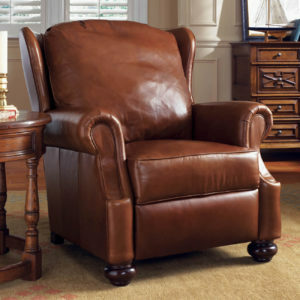 Stickley offers some very contemporary recliner options including the Stickely Grisham recliner, but they also offer some newer models which are quite unique. Stickley offers these recliners in a wide range of material, but the majority are made of Cherry and Oak hardwood to ensure that they remain durable and in great condition. Along with this, Stickely prides itself on their leathers, so the majority of these recliners are built using contemporary leather instead of upholstery. Stickley shows their confidence in their products by offering a lifetime guarantee on almost all of their products. This covers the workmanship and any defects in the material which will be replaced if there’s a problem. Recliner mechanisms are covered for 3 years and dining room/office chairs are covered for 5 years. This is a pretty impressive warranty and can give you some extra confidence in the furniture you’re purchasing. Stickley is very much a high end producer of home furniture and while they don’t have the most variety around they have enough choice for most homes. Each of their pieces is well designed and produced with such great care and quality that it’s a great addition to the home. Stickley aren’t the cheapest brand around and will cost you a fair amount. There are cheaper options available but for the best quality stick to the solid hardwood. Stickley show their attention to detail and careful hand made construction quality in every piece. If your budget allows it then they are a fantastic option and you’ll end up with some durable and lasting items that won’t need replacing for a long time. Find your local dealer today to check out the furniture on offer. Thanks for visiting CHD, if you enjoyed this furniture reviews, check out our other reviews!